Leaving Atlanta is Tayari Jones’s debut novel. 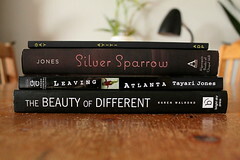 Previously, I read The Untelling (her second novel) and Silver Sparrow (her third). Now I’m officially out of Tayari Jones books and shall have to wait for her to finish writing her next one. Leaving Atlanta is, obviously, set in Atlanta. It’s the late seventies/early eighties. Early in the book, it’s mentioned that the (1976) Olympics was two years past, so I initially thought the story began in the fall of 1978, but later I decided it was actually 1979. This fits with the events that the story is based on, the Atlanta child murders of 1979-81. Tasha is the main character in Part 1. Her part is told in third person. Tasha is unpopular but not the least popular. She’s caught in between her more popular frenemies and the really unpopular kids. Tasha’s parents separate at the beginning of the story but her dad comes back because of the murders. Both Tasha’s parents work and, at the beginning of the school year, Tasha was just starting to be allowed some freedom / responsibility (getting her own key to let herself and her little sister in after school). However, as the murders escalate, her parents decide they need to go a neighbor’s house after school instead of being home alone. All the other kids in her neighborhood do the same. In the second part, Rodney is the protagonist. His part is told in second person. Rodney also lives with his parents and little sister, but his mom doesn’t work, which leads the other characters to think the family is well-off. In reality, his mom’s a bit nutty. She does her kids’ homework (including glitter art projects!) for them. Rodney unwittingly bolsters the image of the family being well-off by shoplifting candy; the other kids don’t know he steals it and think he must have lots of spending money. Rodney is very smart, but an underachiever. When his dad is angry with him, he beats him. Rodney’s even more unpopular than Tasha. Octavia, who everyone in her outside-of-school life calls Sweet Pea, is the main character in Part 3. Her part is told in first person. Octavia lives with her mom, who works nights. Her dad lives with his wife and baby daughter in South Carolina. Octavia is the least popular in the class. Her classmates’ view of her and her family’s and neighbors’ view of her is completely different. Octavia seeks out Mrs. Grier, the second grade teacher, when she needs comfort. Mrs. Grier is the teacher with school supplies and snacks in her desk, the one that all the kids gravitate to even when they’re not in her class. The child’s point-of-view throughout the book—what they know/understand and what they don’t—is so good. For example, as a reader, it’s clear Octavia’s dad is a university professor, but she doesn’t grasp this (she thinks he’s a teacher) or its significance. She wonders why people call him ‘Dr. Ray’. Because of the child’s pov, the story lacks the sentimentality (and judgment) that might be present if it was told from an adult’s point-of-view (e.g. by one of the parents or teachers or one of the children as an adult looking back). In a kid’s world, things just are. This leaves the reader to do the work of interpreting the events. Refreshing. The choice to write the first part in third-person, the second in second-person, and the third in first-person might seem a bit gimmicky but it didn’t feel that way reading it. What it felt like was each part drew you in closer to the characters. I think I’ve said this with all her books, but I don’t know if there’s anyone who’s quite as good at depicting the Gen-X child/teen/YA era—at least as I remember it—as Jones. All the little details are so perfect. This entry was posted in Reading and tagged Books, Books Read in 2013, Fiction, Tayari Jones on September 30, 2013 by Theryn.